How do I copy description and image from Parent stock item to children stock items? In your inventory, you may have stock items that belong to the same stock type and are different only for the colour or the size. These stock items can share the same description or image. To copy the image or description from the parent stock item to the children, follow the procedure outline below. 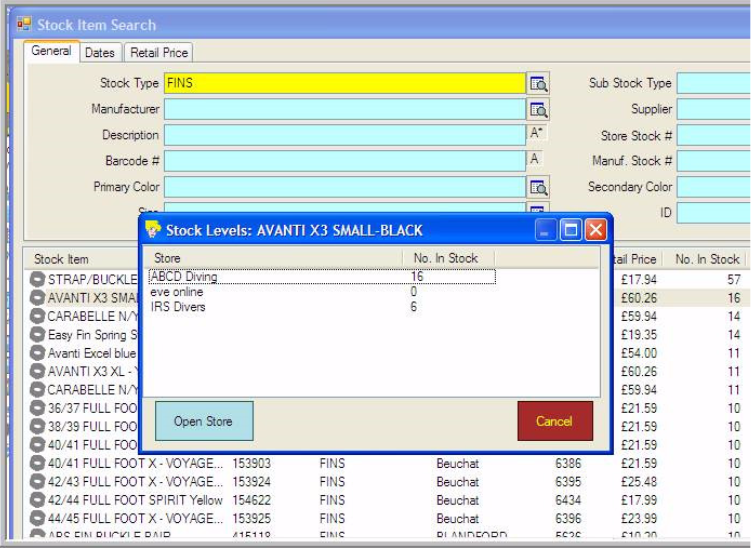 3) Complete a Stock Item Search, by Stock Type and Manufacturer. 2 stock items should be created. One (the pack or multiple) for use with Purchases. So, first should be the full roll of rope at whatever length you might buy it in. Please note that clicking Forward will reveal pictures accurately if they don’t display properly here. And should be the one used to order the rope. The second should be the rope in the smallest increment they sell it in, whether ½ metre or 1 metre, say. 2/ Check in rope when it arrives. 3/ Manually decrement the full roll by the number ordered. So, if ordered 2 rolls reduce no. in stock of full rolls by 2. 4/ Manually increment no. in stock of partial (e.g. ½ metre rope) stock item by whatever, in this example, is the length of 2 rolls of rope. 5/ Sell the ½ metre stock item to customers. Clearly, if the customer wants 20 metres, you sell 40 of this stock item. 6/ EVE will track sales of this stock item. When this ½ metre stock item reaches low level, reorder the full stock item and repeat the process. The best way to do a stock take is to go to Inventory and then select Inventory Count from the power bar at the bottom of the screen. 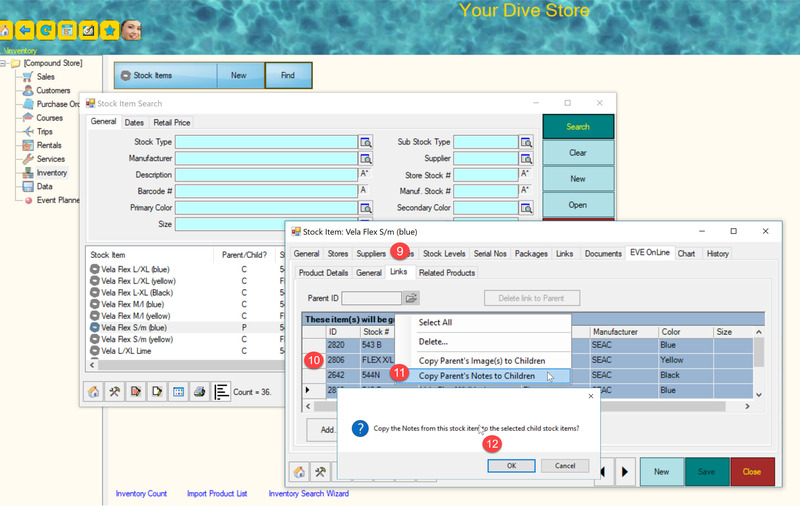 Then select the combination of supplier and stock type that you wish to count first and then select Finish. Selecting OK from the bottom of the screen when you have counted, say, all the fins in stock, will write these records back to each item on the database. Will open Excel and that template. Mandatory data fields have red column titles – optional are coloured black. Save As option and name the file as you wish. Please note: we recommend you take a backup of your EVE database prior to import. By default this will open the Import folder previously mentioned though you can, of course, navigate to any other location where you have saved your Excel files. You’ll find the process relatively simple. Pressing the Space Bar on your keyboard will stop and restart the video for you. 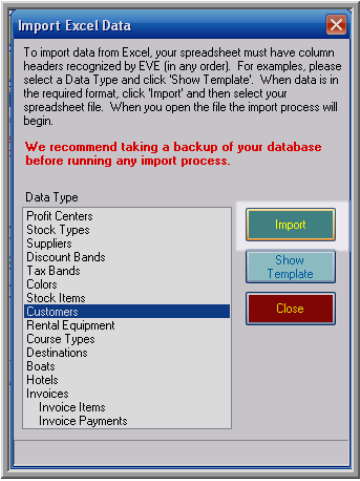 You can import stock and inventory data from Microsoft Excel into EVE. Any row containing data in these columns will be im ported into EVE, regardless of whether there is any data in any of the other columns. Each row (after the header row) in your Microsoft Excel spreadsheet corresponds to one record to be imported. Each column in your Microso ft Excel spreadsheet corresponds to one attribute of the record (for example,Description, Manufacturer etc.). EVE will continue to import data until it encounters 10 consecutive blank rows. This means you can have a few blank rows in your file and EVE will just skip those rows and continue. 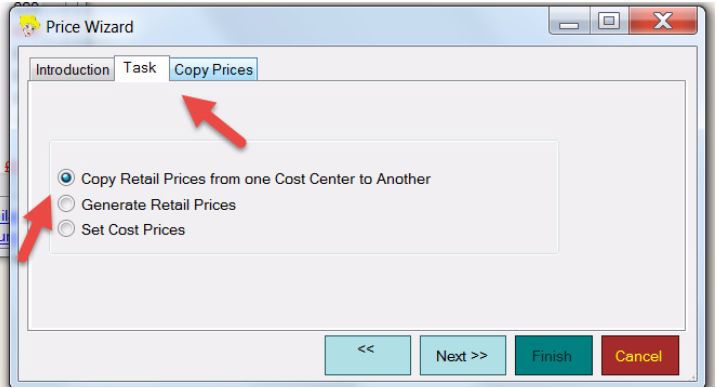 Then go to the Details tab of the supplier record and enter the Cost Price Level – whether 1,2,3, etc. as appropriate. The Cost Price Level that you wish EVE to use by default should be set to the same as the appropriate Cost Price Level in the spreadsheet. EVE allocates the Purchase Tax Band at the Stock Type level. 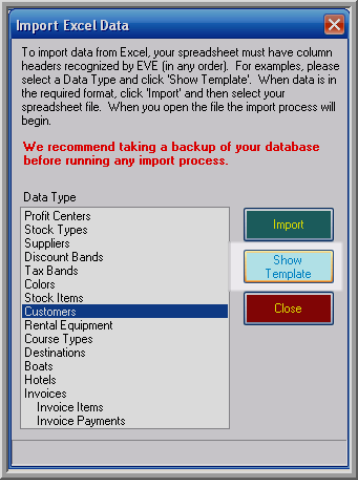 You may wish to check that the Stock Types you have in EVE are associated with the correct Tax Band prior to Import. You can find this area in Inventory / Stock Types / Find and then Search for the appropriate stock type(s). You may encounter duplicates when importing data. Some types of data in EVE require that each record has one or more unique fields. For example, Stock Items must have a unique stock number and a unique barcode number – the stock number of an item must be different than the stock number of all other items and the barcode number must be different than the barcode number of all other items. If you try to import a record into EVE that would violate the uniqueness requirements, EVE will prompt you how you want to continue. 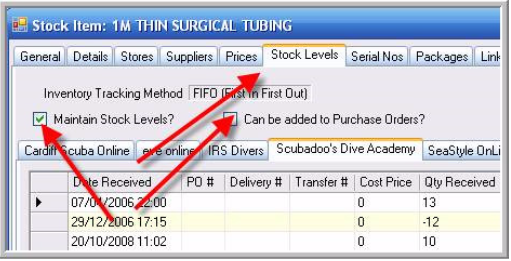 In the figure below, a stock item record is being imported that has the same stock number as an existing item. You must tell EVE how to continue by choosing an option in the action section and optionally changing the value in one or more of the white fields. You can scroll down to see all fields on the original and import row. Click Overwrite if you want to overwrite the existing record with data on the import record. You must decide what you want to happen if there is no data in a particular column on the import row. You can choose to update the corresponding column on the existing record to be blank or you can choose to leave the existing column alone. 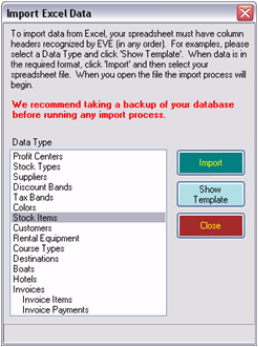 The decision you make may depend on the circumstances: for instance, if you are importing a supplier stock list to update prices on Stock Items from that supplier, you will probably leave the No In Stock column blank on all rows in the import file. In this case you will not want to update the No In Stock on all existing records as this would wipe out all your stock levels. Not all columns have the option of being handled th is way. For instance, columns that are mandatory can never have a blank value on the import record. EVE will put an icon next to column names for which this handling is valid beneath the query symbol. By default, the icon will be implying that the existing value will be left unchanged if the import value is blank. Click on the tick to change it if you want the existing value to be blanked out if the import value is blank. 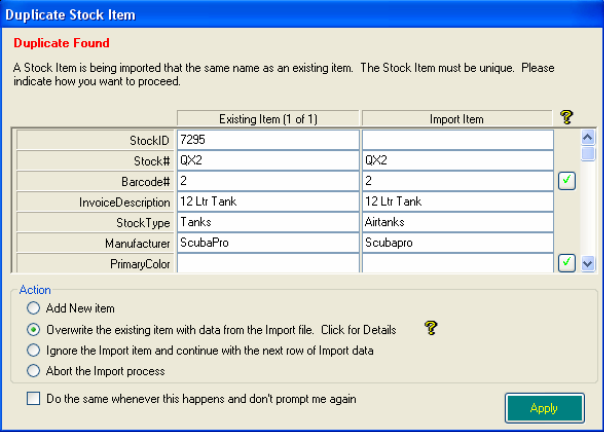 When doing a stock item import it is possible that the record being imported has the same Stock No as one existing record and the same Barcode No as a different existing record. 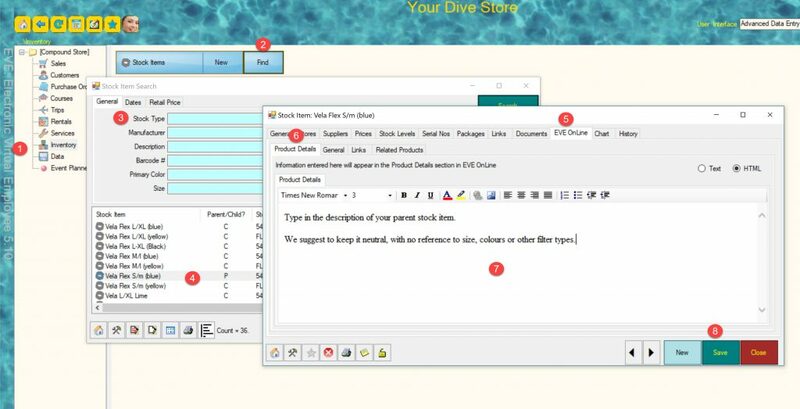 In this case, EVE will report that duplication errors have occurred on both stock # and barcode # and it will present both existing records to you as well as the import record (there will be two icons next to the existing item text showing a one and a two. Click on each icon to show the corresponding existing record). Be carefu l when handling this case – you will need to choose carefully whether you want to update the existing record(s) and/or the import record before resolving the duplicates. 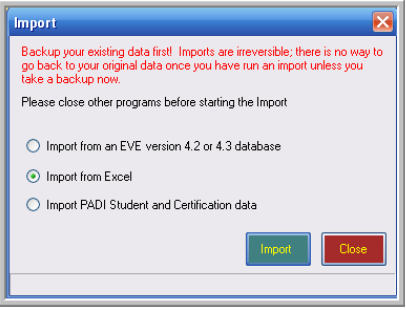 Click Retry if you want to instruct EVE to try again to import the same record. There is no point in doing this unless you have made a change to the data in one of the white text boxes of the import item. For example, you could change the stock # so that it is no longer the same as any existing stock #s.
Click New if you want to instruct EVE to create a new record. Again, there is no point in doing this unless you have made a change to the data in one of the white text boxes of the import item – otherwise you will simply get another duplication error. Click Abort to abandon the import process. All data already i mported will remain on the database. 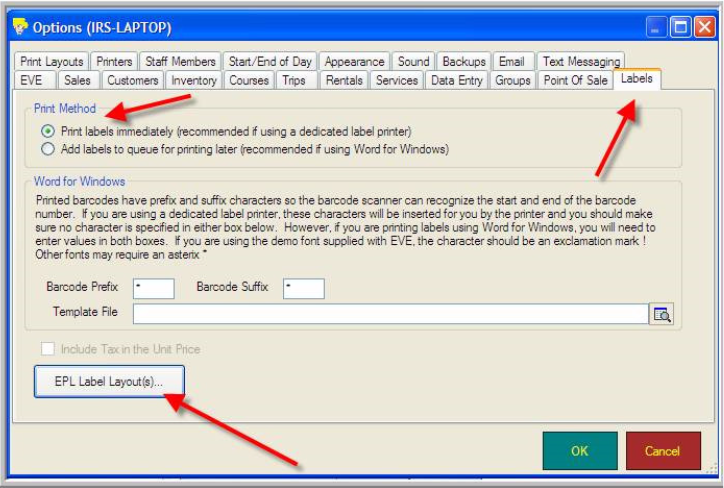 Barcode scanners must be keyboard wedge scanners in design – i.e. it simulates the action of entering data via a keyboard – though connection, can, of course, be vi a USB port or wirelessly. If possible, we recommend purchasing a scanner that can be programmed with an F9 prefix (i.e. when you scan a barcode, an F9 is appended to the start of the barcode information before it is sent to EVE) – as then EVE will set focus to the Barcode field on the Invoice automatic ally. 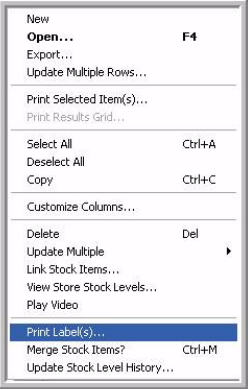 To configure the Zebra Printer go to Tools / Options / All PCs from the top menu in EVE and then click the Labels tab. b/ then click on to the EPL Label Layout(s) button. If you have different labels or wish to move things around then you can edit the settings as you see fit. You’ll then need to test the resulting labels you print with your scanner. For printing the labels please remember to use the EPL printer option. 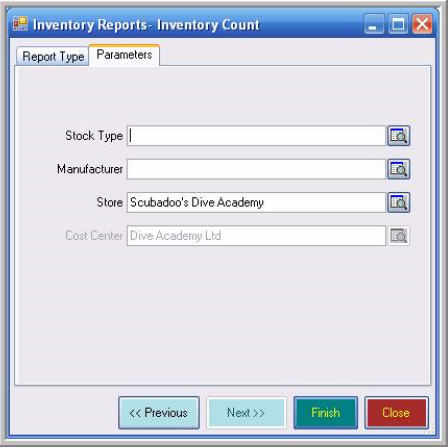 Go to Inventory / Stock Items / Find and then enter the search criteria you want. EVE will, by default, print the same number of labels as items that you have in stock.